The Federal Motor Carrier Safety Administration (FMSCA) issued a notice of proposed rulemaking (ANPRM) regarding changes to a rule that established financial security for brokers and freight forwarders. In this ANPRM, the agency is considering revoking the operating authority of brokers and freight forwarders whose surety bonds and trust funds fall below the federally required $75,000 amount that was established by the Moving Ahead for Progress in the 21st Century Act (MAP-21). MAP-21 was enacted by Congress in 2012, which raised the financial security amount for brokers to $75,000 and established financial security requirements for freight forwarders. Under existing regulations, brokers and freight forwarders must have a surety bond or trust fund in the amount of $75,000. As a condition to obtain registration, brokers and freight forwarders must provide evidence of the surety bond by filing a form BMC-84 or the trust fund by filing a form BMC-85 with the FMCSA. The FMCSA began accepting comments on the proposed rule on September 27, 2018. Comments can be submitted at the Federal eRulemaking Portal via Docket number FMCSA-2016-0102. Comments will be accepted through November 26. 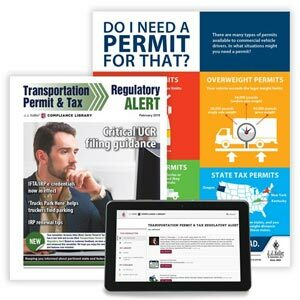 J. J. Keller's Motor Carrier Permit & Tax Update provides regular updates on changes to permitting and reporting requirements.